November | 2006 | Follow That Elephant! What do you like about your day? When would you go back to? Although I am perfectly happy traveling the world as a technology teacher now, if I had to choose one time to go back to it would be my university years. Those four years of college felt so full of possibility and energy in such a care-free way. Having no real responsibilities, and no one to answer to, made every day an adventure. I went to school about two hours away from my family, at the University of Connecticut. Just far enough so that I felt like I was on my own, but close enough that I could easily get home if I needed to. UConn is a large school, but was started as an agricultural college, so it’s out in the middle of nowhere, surrounded by fields (with cows and horses). Even though the school was isolated, we had so many students around that it was like it’s own city – a city just for students. It was a place that I felt totally safe and secure, but also a place that posed challenges and questions that I could spend all my time thinking about. I felt like I could do anything, go anywhere, be anyone. Now, as an adult, I feel more settled in the life I chose, a good kind of settled, but sometimes I do miss the freedom of university. If you could go back in time to some point during your life, when would you go back to? Once again, I am inspired to continue a story I started in a comment from earlier this week. I have mentioned in the past that Malaysia is an incredibly easy place to live, perhaps even too easy. However, this does not seem to stop me from my compulsive stockpiling of non-perishable food/toiletry items. I’m not really sure where or how I learned this behavior, but it reaches far back to my university days as well. Back in my first weeks at UConn, before anyone really got to know me, my new friends would look with shock and surprise at the plastic containers full of ramen, granola bars, fruit roll ups (I love fruit roll ups, why don’t they make them the same as they used to? ), and other non-perishable snacks; alongside other plastic containers full of deodorant, shampoo, soaps, and other toiletries I could not live without, that I stored under my bed. Did I ever actually eat these snacks or get to use up all those toiletries: No. I usually gave away or hoarded all my snacks until the last few days of school and then would have a feast with my friends. And I think a few of those bars of deodorant have followed me through Munich, and all the way to Malaysia, and are now resting comfortably with the 15 other bars I have been steadily building up over the last 7 years. The year is 1999. My mother is in charge of the Y2K conversion for all IBM offices in Europe. The depth of concern and confusion surrounding the possible effects of Y2K is on the news 24 hours a day. People are building bomb shelters in their basements for fear of the entire world simply exploding upon this “new century.” My mother has become so involved with this Y2K scare that in, oh, let’s say, January of 1999, she starts stockpiling water. We have an entire closet full of Poland Springs water by the time I go back to UConn after Christmas break (mid-January). I come home in the summer, and all three pantries in our kitchen are filled to the brim with non-perishable items: canned soups, canned fruits, pasta, and, of course, more water. The panic continues to rise. My mother considers purchasing a generator and wood burning stove in case the world shuts down on Jan 1 2000. We have six months to go…. Fast forward 6 and half years…. Last summer when I was home, I drank water from 1999. We still have bottles of water that we have not been able to finish from almost seven years ago. Now that’s stockpiling. Now I’m not saying that witnessing that particular paranoia caused me to be the stockpiler that I am today, but I’m thinking there might have been more subtle tendencies in my household before 1999. And, that, perhaps, is the root of my obsession. At this point I think I have 4 jars of pickles in our kitchen cabinets, at least 15 bars of deodorant in the bathroom, easily 2 pounds of cotton balls stored in the “linen closet” (a term I use loosely to mean: the area in my bedroom, underneath a random shelf, which is slightly out of sight and has no other visible use), a collection of about 400 empty DVD cases (since I’ve put the actual DVDs into those cute little binders they have here), and every magazine I’ve ever purchased in the spare closet in our 2nd bedroom. To give myself a little credit, some of this stockpiling habit has come from living abroad. There were quite a large number of things I simply couldn’t get in Germany (surprising, I know, but true). 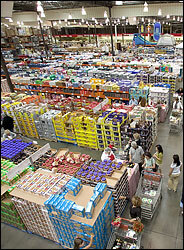 I believe that only furthered my desire to create a whole warehouse full of superkimbo favorites. Why go out to shop, when I can just rifle through my cabinets to find that one extra bottle of face wash I bought in 1997? Your date of conception was on a Monday. Your birthday falls into the Chinese year beginning 2/18/1977 and ending 2/6/1978 which is the Chinese year of the Snake. Your Native American Zodiac sign is Raven; your plant is Ivy. You were born in the Egyptian month of Choiach, the fourth month of the season of Poret (Emergence – Fertile soil). All of which prompted me to further research the zodiac signs to see if they fit my personality. (Unfortunately I couldn’t find much about the Egyptian month of Choiach, so if anyone knows anything about that, please pass it on). I’m always curious how everyone born in the same year (for example) could possibly be the same. There was quite a lot more in the birthday calculator too… What does your birthday say about you? Since we moved to Malaysia I have basically stopped cooking. It’s just too damn hot. I can’t bear to stand over the flaming gas stove with sweat pouring into my eyes as I try to navigate my slightly cramped kitchen. It doesn’t really put me in the mood for a tasty dinner. Plus, eating out is so cheap and easy. The only problem is that I really enjoy cooking. I have about 100 cookbooks that I’ve been lugging around all over the world, and I really really want to use them. One of them, Cook 1.0: A Fresh Approach to the Vegetarian Kitchen by Heidi Swanson, especially. I bought it just before we left Munich (where I cooked every day) so I have only used it a few times, but I already know I love it. I don’t cook meat at home, so I mostly own vegetarian cookbooks and this one is truly unique. But what makes this particular cookbook so special (to me, anyway) is it’s layout (and the fact that Swanson is a professional photographer so it’s beautiful and stylishly designed). The book is set up by technique, rather than by recipe. 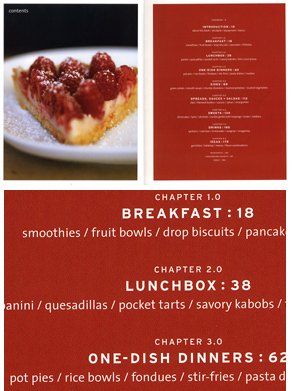 Instead of including one way to cook each dish, Swanson makes each dish into it’s own mini chapter and explains (using a very simple and easy to understand table set-up) how to create the same type of dish with different ingredients. For me, this is a great way to cook. Not only do I get the opportunity to understand how to make many different recipes using the same technique, but I also find it easier to remember the different dishes when they are organized by step and process, rather than by final product. As a teacher, I know it’s easier to learn new things if you can make connections to something you already know, so this method is a very logical and effective way to approach cooking new dishes. I find it encourages me to try new things and to experiment with different ingrediates, which is exactly what I want from a cookbook! Trees overtaking the temples of Angkor outside of Siem Reap, Cambodia. 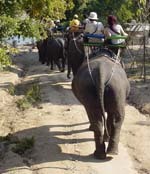 See more of our pictures from Cambodia or read about our trip. 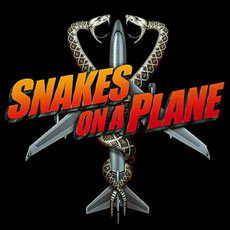 Snakes on a Plane – Really. I think the key phrase for me is “wearing diapers to conceal the stench of their urine.” As far as I’m concerned, this is someone who’s really thought through the process of attempting to smuggle reptiles on a plane. This person is officially (at least, “officially” according to me) a professional reptile-plane-smuggler. I mean: what kind of diapers do lizards wear? How did this person come up with this idea? How did she successfully force all those lizards to wear the diapers? How were they supposed to get through the x-ray in the first place? I wonder how surprised the woman was to get caught. I’m imagining her look of utter shock and disbelief that the reptiles didn’t actually make it on the plane: How ever did they figure it out? I put the diapers on and everything! They couldn’t have found them by smell! This was a fool-proof plan!